Scenes from a daily commute by bus, bike and BART from Oakland to San Francisco and back were recorded in a journal through 2011. 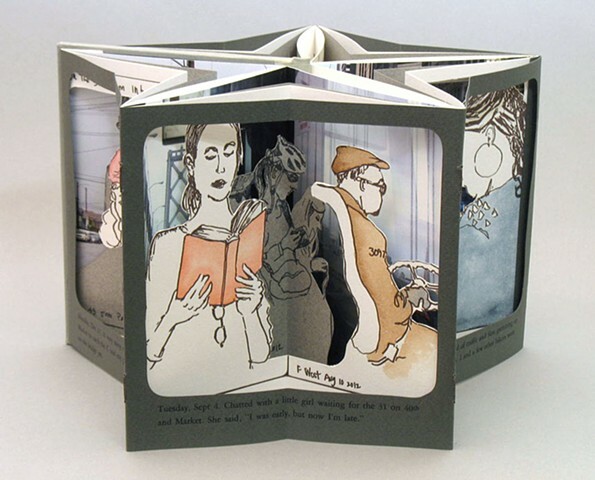 Drawings of commuters are letterpress printed, hand colored and cut and layered over a phone photo and bound in a carousel format. The five vignettes frame views through a bus window with a journal entry for each day of the work week.